Combine melted butter and honey; mix well. Combine with cinnamon-raisin bread; toss until cubes are coated. Spread out on baking sheet and bake at 275°F 15 to 20 minutes or until crisp and lightly toasted. Mix 4 parts honey to 1 part hot water in a saucepan. Heat gently over medium-low heat until the mixture reaches a simmer. Remove from heat and cool to room temperature. To store, transfer the syrup to a squeeze bottle or covered drink pourer for easy pouring. Store at room temperature.Build in order over ice in a 12-oz. glass and stir. Blend 1/4 cup honey with orange peel and cinnamon; set aside. Arrange apples in 9-inch round or 8-inch square microwave-safe baking dish. Fill center of each apple with 1 tablespoon honey mixture. Cover with plastic wrap; vent. Microwave on HIGH (100%) until almost tender; rotate dish 1/4 turn halfway through cooking time. Drizzle remaining honey over apples and allow to stand 2 to 3 minutes. Grease 12 muffin cups with 1 Tablespoon butter. To prepare honey nut topping, mix together 1 Tablespoon butter, 1/4 cup honey and chopped nuts. Place 1 teaspoon topping in each muffin cup. To prepare filling, mix together remaining 2 Tablespoons butter, remaining 1/4 cup honey and cinnamon. Roll out bread dough onto floured surface into 18 x 8-inch rectangle. Spread filling evenly over dough. Sprinkle evenly with raisins. Starting with long side, roll dough into log. Cut log into 12 (1-1/2-inch) slices. Place 1 slice, cut-side up, into each prepared muffin cup. Set muffin pan in warm place; let dough rise for 30 minutes. Place muffin pan on foil-lined baking sheet. Bake at 375°F. 20 minutes or until buns are golden brown. Remove from oven; cool in pan 5 minutes. Invert muffin pan to remove buns. Bees a bit much for a wedding? Consider them for a bridal shower theme! 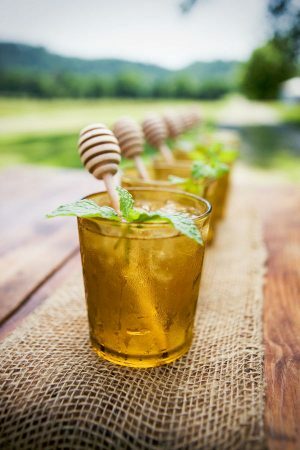 photo credits: cookies, honey jars, honey dipper swizzle sticks, bee picture, honey cake, menu, bee streamers, silverware, boutonniere, honey sticks, recipes. Cake board: cupcakes, beehive top row, beehive bottom row, daisy cake. These are such great suggestions! (I am esp. digging the thought of making a Remains of the Day one) – I’ll see what I can do and thanks for the ideas!